Why Tran restaurant is special ? Apart from its beautiful white sand beaches, Da Nang is also well known for its delicious speciality dishes. Amongst local specialities, Banh trang cuon thit heo (pork and vegetables wrapped in soft rice paper) is the most popular, and the Tran restaurants are good places to try it. 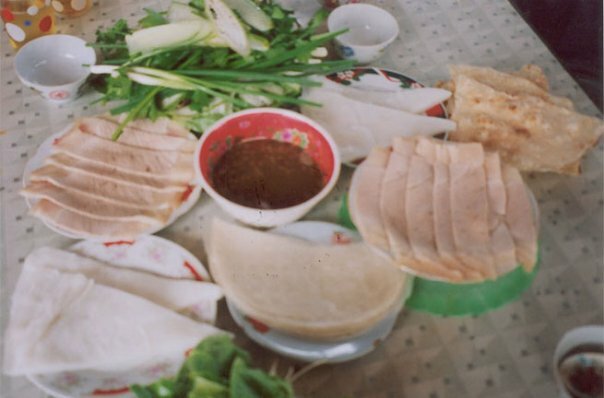 Banh trang cuon thit heo, which is one of Da Nang’s three traditional culinary dishes, has made it into the list of Vietnamese specialities. It is a nutritious food with fresh ingredients - pieces of rolled belly pork, a variety of fresh vegetables and herbs, along with thin slices of cucumber, green bananas, and a dipping sauce. The vegetables are bought from Da Lat, Hoi An and Da Nang. Furthermore, various dipping sauces, suitable for the tastes of visitors from the north, south or central regions, are also provided. In addition to Banh trang cuon thit heo, the Tran restaurants also serve other local foods, including My Quang (Quang Noodles), Bun mam thit quay (vermicelli with roasted pork and salted fish), Banh trang dap (crushed rice paper), and Banh beo (round-cakes). Many foreign investors have recently shown interest in buying the Tran brand name for a price of 4 million USD. However, the Founding President of the Tran company, Mr Tran Thanh Tuan, affirmed that he would never want to sell his brand name because he has a strong desire to conserve the city’s speciality dish and the pride of its people. It is said that the Tran restaurants are the best places for local people and visitors to enjoy the city’s delicious speciality dishes. They can visit the city’s Tran restaurants at 300 Hai Phong Street and 43 Do Quang Street in Thanh Khe District, as well as at 4 Le Duan Street and 28 Duy Tan Street in Hai Chau District. How to get to Tran restaurant? The suggested vehicles to come to the restaurant include motorbike, bike, car, taxi, cyclo. By walking: If you are in Han River Bridge, it takes about 10 minutes to get there. Another restaurant is located at 4 Le Duan Street. By motorbike: If you are in Vietnam airlines office in Da Nang, you go straight on Phan Thanh Street and turn left on Ly Thai To Street. Then you turn right on Le Duan Street and turn left on Hai Phong Street to get there. It takes about 5 minutes by bike. If you find the dipping sauce too pungent for you, ask for a different sauce to eat this dish. Another good food served is Quang Noodle. 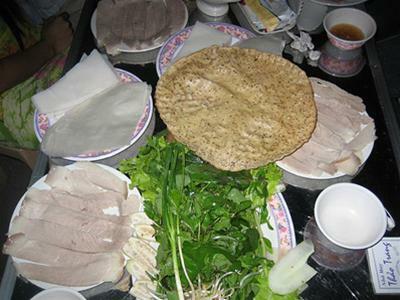 There are less than 10 dishes in the food menu and all are regarded as local specialty. The restaurant has 4 branches in Da Nang, so you should check on their website to choose what branch is comfortable for you. Try the sauce discreetly because it is strangely hot. Wrap roll with herbal with two-side-skin pork, eat with special sauce. 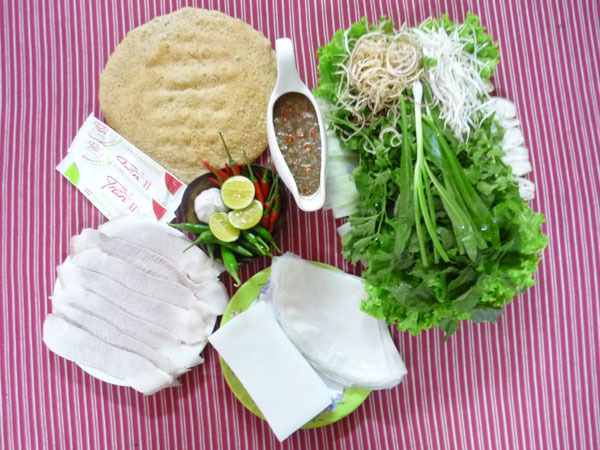 This is special dishes when you come to Da Nang. Cannot find anywhere! The sauce is very very special but very hot. Sheltered outdoor seating only but if you are a tourist, this can be part of the adventure of travelling as you can soak in the local ambience (98% locals) if you enjoy making your own rice paper rolls and you like lots and lots of salad. If you go with crowded group, you should reserve by calling to the restaurant. If you go with kids, you should pay attention them to avoid bumping into someone.